This post is part of a compensated campaign with Maseca, but all opinions and the recipe here are my own. Atole de calabaza is a masa-based beverage made with milk, thickened with Maseca corn flour, and served hot. This pumpkin-flavored version tastes similar to pumpkin pie and is perfect for serving around Thanksgiving. Although vanilla, chocolate (called champurrado) and strawberry are the most common atole flavors, there are many other common flavors such as pumpkin, or modern, non-traditional flavors such as blueberry cardamom atole. 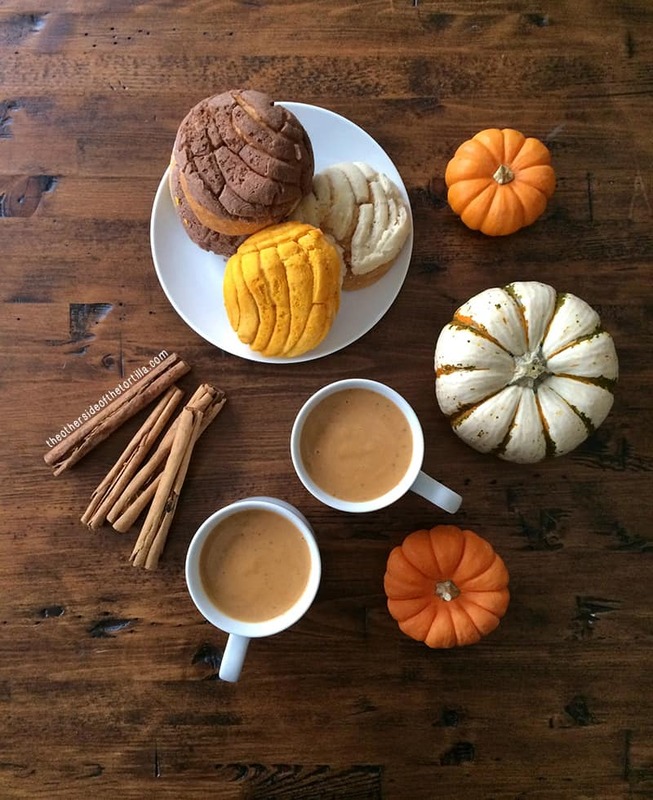 I love to serve this pumpkin atole with conchas (a type of pan dulce, pictured above). Thanksgiving is right around the corner and pumpkin pie is always a staple in my house at this time of year. As a kid, I always used to want to drink the leftover pumpkin pie filling, which my mom would warn me against doing since it contains raw eggs. I’d manage to drink some anyway and usually everything was fine, but occasionally, I’d end up with a stomachache. This atole tastes very similar to pumpkin pie filling thanks to the creaminess from the evaporated milk and has no risk from the eggs like pumpkin pie filling. What more could I ask for? It’s the perfect breakfast or dessert when served with some pan dulce! If the consistency is a little too thick for your liking, you can thin it out a little by adding a half-cup of 2% milk at a time until you reach the desired consistency. A note about the vanilla: If you’re not going to use real vanilla bean, I recommend Nielsen-Massey pure Mexican vanilla extract, which is available in my Amazon store. THIS RECIPE IS GLUTEN-FREE AND VEGETARIAN-FRIENDLY. 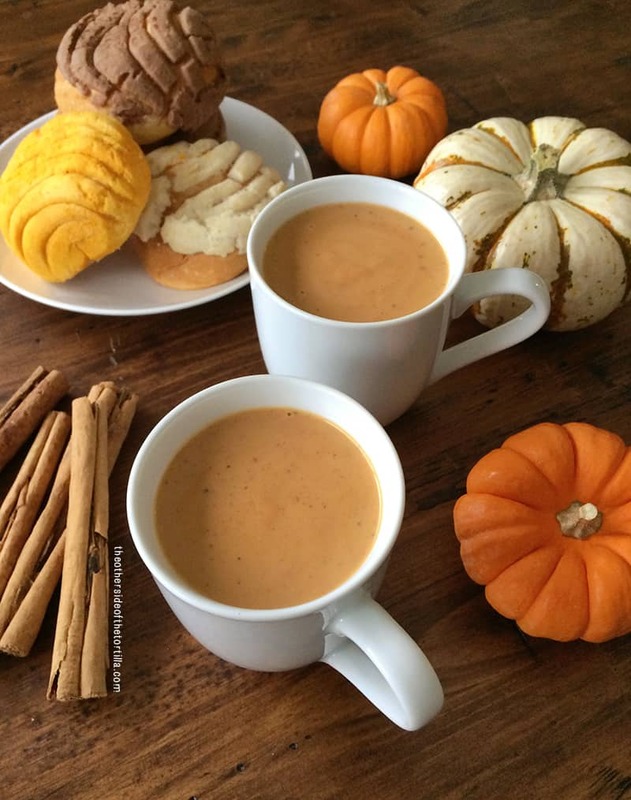 Atole de calabaza is a masa-based hot beverage, popular during the holidays, and made with pumpkin puree, milk, evaporated milk, sugar, Maseca instant corn flour, vanilla and Mexican cinnamon. In a saucepan over low heat, dissolve sugar in water with cinnamon sticks and cloves. Allow cinnamon to infuse for about 10 minutes, but do not boil. Remove cloves and discard. Remove cinnamon sticks and set aside temporarily. Whisk in 1 cup canned pumpkin puree, 12 ounces of evaporated milk and 2 cups of 2% milk. Reduce heat to a simmer and allow to heat through, about 10 minutes. Whisk in 1/4 cup Maseca instant corn flour and then add the cinnamon sticks back in. Add vanilla extract or vanilla bean, stir well, and cook for another 5-10 minutes, depending on how thick you want the atole to be. Remove from heat and allow to cool slightly before serving. Get more ideas for recipes made with Maseca at mimaseca.com.